After waiting 20 years, I finally have been able to see Morocco in person! I would like to congratulate Schehera on the wonderful job she did putting together the Morocco Workshop that was held in Dayton, Ohio, November 6, 7 and 8, 1998. It was the first time I’ve met Schehera also. I really enjoyed talking with her and hope to go to the next workshop she sponsors. It was a thoroughly enjoyable weekend! The first evening, Friday, November 6, there was a show that started at 7:00 p.m. All of the performers in the show on Friday night were from Ohio. They were all wonderful dancers. There was a very good variety of performances. There was cabaret, ethnic, solos and troupes. For someone who doesn’t get to go to many workshops, it was great to be able to see all the different dancers, their costumes and the different types of routines they performed. Then came the workshop on Saturday with Morocco. The lady is absolutely indefatigable. Just like the Energizer Bunny! She is a great instructor. 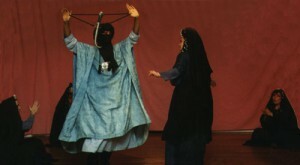 Morocco has a wonderful sense of humor, which she incorporates in her teaching that makes learning the choreography fun. She would combine a few steps and practice them several times. Then she would add a few more steps to the first steps and start from the top again and practice that sequence several times. She would keep going on like that until the end. I was really tired, but you sure knew the routine by the time you got done. She was very nice about answering any questions (and some they didn’t have) about the moves or anything else. The friend that I went with and I missed out on the afternoon session, which was to be an explanation/ technique of the Moroccan Guedra. Our loss. The Saturday evening show was, again, fantastic. Morocco started the show with a Guedra blessing. There were a lot of wonderful performers from several states, who did solos and troupe performances that evening. Then Morocco finished up with an Oriental routine. I was able to see a lot of performers I never thought I would never see. One troupe from Pennsylvania had live musicians who drummed after the show for a little while. I only wish that the facilities could have stayed open later for a little partying. On Sunday morning we started a new routine using the same learning format as Saturday. In the afternoon my friend and I left early to get home (about a 6 hour drive). Raks-Al-Fellahin was the vendor at the workshop. When we heard there was only going to be one vendor we were kind of disappointed, but after seeing all that they had, we were absolutely not disappointed. In fact, we both spent way too much. They had a very nice variety of merchandise. Everyone we met at the workshop was very nice and the atmosphere was very friendly. Morocco was very easy to talk with and was very knowledgeable and eager to help people understand the moves or anything else they had a question about. Well, at least in my (and my friend’s opinion) it was a really great weekend and one we won’t forget.